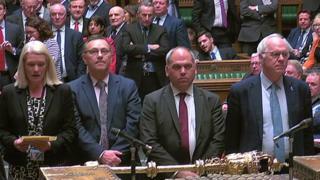 Labour’s Brexit plans – which would see the UK joining a customs union with the EU – have been defeated by 323 to 240. Labour leader Jeremy Corbyn had said his party will back another EU referendum if the plan was defeated. MPs are now voting on an SNP motion saying the UK should not leave the EU in any circumstances without a deal “regardless of any exit date”. Theresa May has promised MPs a meaningful vote on her deal with the EU by 12 March. If her plan is defeated, then MPs will get votes on delaying Brexit and ruling out no-deal, said the PM in a significant change of policy on Tuesday. Brexit: If not 29 March, then when? The move was designed to head off a possible defeat when MPs vote on an amendment tabled by Labour MP Yvette Cooper, which asks for the same thing. Ms Cooper has not dropped her amendment, because she wants to hold Mrs May to her word – although the government has said it accepts the proposal. Conservative MP Alberto Costa has withdrawn his amendment, which sought to protect the rights of UK citizens in the EU and vice versa, even if there is a no-deal Brexit, because the government accepted the plan. Mr Costa said he was still forced resign as an aide to Scottish Secretary David Mundell because of a convention that members of the government cannot table amendments to government motions.